Tom Simoneau is in studio for California Wine Country with Steve Jaxon and Dan Berger today, and he has brought with him Jeff Mangahas and Mark Malpiede from Williams and Selyem Winery. Jeff Mangahas is the winemaker and Mark Malpiede is VP of Sales & Marketing. 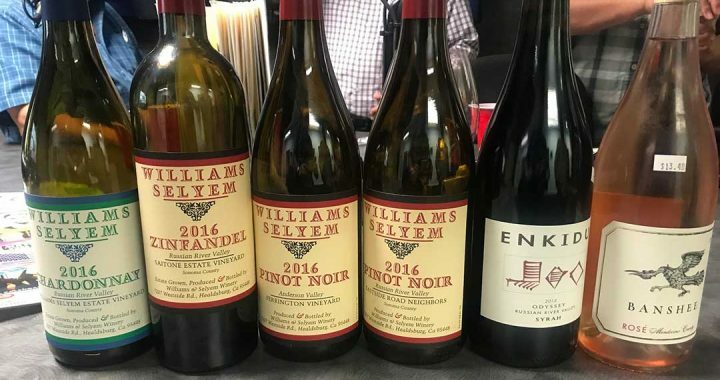 Williams and Selyem is known for Pinot Noir and Chardonnay and some Zinfandel. They are located in Healdsburg. Today Jeff and Mark brought some wines that are to be released in September this year. 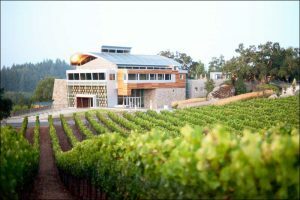 The winery got started by Burt Williams and Ed Selyem in their garage in the late ‘70s, Fulton (the gateway to Windsor). Their wines got a lot of notoriety soon. It was called Hacienda del Rio. There was another winery called Hacienda which claimed the name, so they changed to the founders’ two last names. 1981 was the first commercial release. Dan says the Hacienda was actually the garage. As they taste a Zinfandel, Dan mentions that its good acidity and low pH are the keys to wine that will age well. Dan has known their wines since 1986. He would buy them at Spear’s but only there, they weren’t on sale anywhere else. As he aged the wines he noticed that these Pinot Noirs matured very well and showed their terroir the most. Tom agrees that Pinot Noir has to be grown in a cool spot, good drainage, tiny crop, ideally. And Dan agrees that if you try to make too much, it’s no good. Most of their grapes are grown in the Russian River Valley. They will taste some Russian River Valley Pinot (and also an Anderson Valley one). 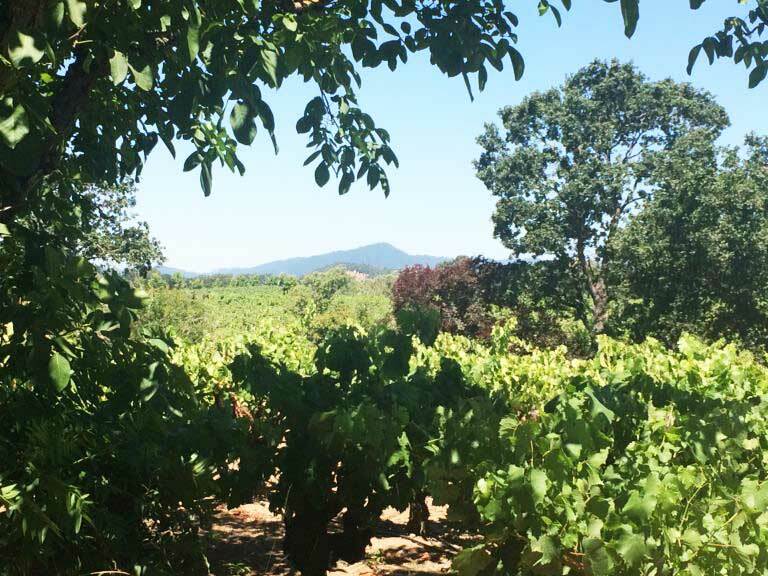 It’s an interesting AVA because there are so many microclimates and different kinds of soils. Tom notes that since they make such a small amount of wine, they can really keep the bottlings separate. Indeed, they make five different vineyard designated Pinot Noirs all from that area and they are all unique. They only use one type of French oak barrel, and they use their own proprietary isolate of yeast. They also use the same type of tanks. 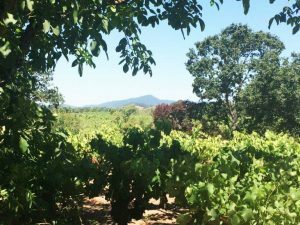 So when you taste the differences in flavor profile, tannin and acid structure, you are tasting the vineyards’ differences, because everything else in the process is done in their same steady way. Now they taste a 2016 Chardonnay from Russian River Valley. They make 6 single vineyard Chardonnays and one blended unoaked Chardonnay. Apart from Zinfandel, some of the first plantings in the Russian River Valley were Chardonnay, not yet Pinot Noir. This is a new wine, from rather young vines on the William Selyem Estate, on their property on West Side Road by the bank of the Russian River. It has very well-drained soils. The grapes have a very slow ripening process. But there are 20 different clones and selections of Chardonnay that are all interplanted in this field and they are all harvested at the same time. It’s all barrel fermented, with about 20% new oak. Dan says you don’t taste Montrachet from France that is this good and that this should age from 4 to 6 years. Jeff says that a lot of these clones, especially growing in the cool climate of the Russian River Valley have thick skins, which adds a texture to the wine that allows it to age and gives it a lot of structure. Dan fires off a Geek Alert as he notices it has good Leucoanthocyanidin, which is white wine tannin. Barry Herbst notes that their property is a great visit. Jeff and Mark tell how you have to be on the list first, to be able to visit the property. There is a waiting list so if you enroll now, you’ll be on by the Fall. 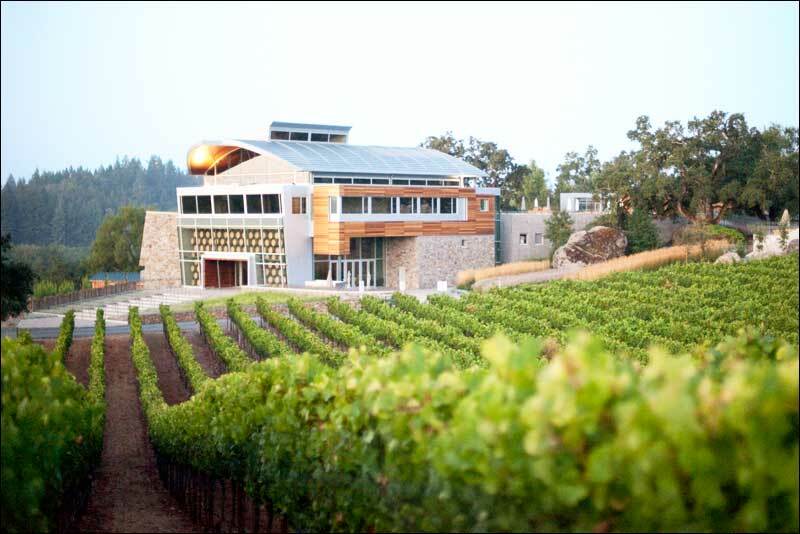 The tour is all built around hospitality in one of the most beautiful spots in the world, overlooking the Russian River Valley. The tour is 90 minutes and involves tastings and some special surprises. Their logo does not have “and” between the names but the full name does. They taste a 2016 Ferrington Pinot Noir, from Anderson Valley. Jeff points out that Pinot Noir is one of the wines that it is easier to drink young. As they taste it, Tom says he condiders these wines feminine, with a soft touch. He likes the fruit dominant palette and varietal character. It’s terrific now and will be even better in four more years. Steve “Drink-It-Now” Jaxon asks Dan “Lay It Down” Berger to discuss the reasons for letting this wine age. Dan says it’s too young for him to appreciate the flavors that he can’t taste yet. Next they taste the 2016 East Side Road Neighbor Pinot Noir. Barry notes it has a different fruit profile, strawberries and rasberries says Dan, orange blossom, says Tom. Dan mentions about Robert Lawrence Balzer, his late friend and colleague. He was a dear friend of Dan Berger and now, Dan and his wife are publishing his memoirs. He was the chief wine correspondent at the LA Times for many years and worked with Dan there. He also taught wine appreciation classes at UCLA Extension. He passed away a few weeks shy of his hundreth birthday. Dan tells how Balzer explained a comparison to the taste of the best Pinot Noir this way: take the finest rose in your garden, put it in a vase with no water, wait two days and then smell it. Tom suggests he was the André Tchelistcheff of wine writers. Dan says he was one of the most fascinating characters he ever met. Next they taste a little Zinfandel. Jeff gives the history of Zin in the Russian River Valley. In the late 1800s Italian immigrants settled the area and brought vines from their home country. Some of these vineyards still exist. Saitone Vineyard is one of them, planted in 1895 and still producing. Older vines tend not to produce as much but it is right in the middle of the Russian River Valley, in front of the Pellegrini Winery. It gets 2 tons to the acre, which is a lot for a vineyard that old. Jeff says they are a Pinot Noir house and so they practice the same winemaking techniques on their Zinfandel. This site has a natural 3-4 pH range which gives it a vibrancy and freshness. Dan tastes rasberries and fresh plums. Barry Herbst mentions that Bottle Barn will hold a 3-hour Rosé tasting with 60 Rosés, on the Summer Solstice (June 21, a Thursday night). Anyone interested should sign up at Bottle Barn dot com to be eligible to sign up, as there is limited space.